Although the CALCULATE function is by more useful (and often easier to understand), DAX programmers should also learn about the FILTER function. This provides another way to change the query context for any aggregation. 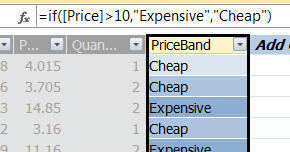 This blog shows how you can filter tables to aggregate only over subsets of data. A typical DAX function, asking for a table as one of its arguments. 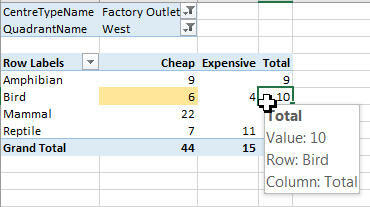 Wherever this happens, you can supply a filtered subset of the full table's data instead, using the FILTER function. In many cases you can use the CALCULATE function instead of the FILTER function to produce the same results (the resulting formula is usually easier to understand, too). We'll create 3 measures, showing cheap, expensive and total sales. A cheap sale is one where the price was £10 or less; expensive implies a price of more than £10. One way of solving the problem - but it wouldn't teach you anything about the FILTER function! So for example the Cheap measure will sum the quantity, but only where the price for a transaction is less than or equal to 10 pounds. The number 6 in the shaded cell is calculated as below. The first six cells (shown selected above) give sales of cheap items where the price is less than or equal to £10. The sum of the quantities is 6, which explains where our figure in the pivot table comes from (the equivalent total quantity for expensive items is 4). You could have achieved exactly the same effect with the formula =CALCULATE( SUM( [Quantity]),'Transaction'[Price]&LT;=10 ). This is IMHO much easier to understand! We'll calculate the percentage of total sales for each query context. You could do this using CALCULATE by removing each dimension constraint individually, but the FILTER function allows you to remove all constraints in one go. The ALL function removes all constraints from the denominator in our ratio. We want to show total sales for each cell as a percentage of total sales for mammals. The only cell which should yield 100% is the one shown shaded. So the denominator of the ratio calculates the total quantity for all transactions (jettisoning any query context constraints), but with an additional requirement that the species should be Mammal.